Turkish police have arrested the gunman who killed 39 people in a mass shooting at Istanbul nightclub ‘Reina’ on New Year's Day after a two-week nationwide manhunt, according to Prime Minister Binali Yildirim. “The attacker behind New Year's night assault on the club is captured. He is currently in the hands of police, where his interrogation is still taking place. It is still too early to talk about any results, but the investigation will identify all those who stand behind this attack,” Yildirim said on Tuesday. State-run Anadolu news agency earlier reported that the assailant was caught with his four-year-old son in Istanbul's outlying Esenyurt district. Istanbul governor Vasip Sahin stated on Tuesday that the attacker, who was identified as Uzbekistan-born Abdulgadir Masharipov, had admitted his guilt. Authorities state that he is responsible for slaughtering 39 people and wounding 65 others in Istanbul during New Year's eve celebrations. According to the governor, the attacker was trained in Afghanistan, then entered Turkey illegally and carried out the atrocity on behalf of Islamic State (IS, formerly ISIS/ISIL). Four more people were arrested in connection with the incident along Masharipov, one man of Kyrgyz origin and three women, from Egypt, Somalia and Senegal respectively, Andalou reported. Their identities have not yet been made public. 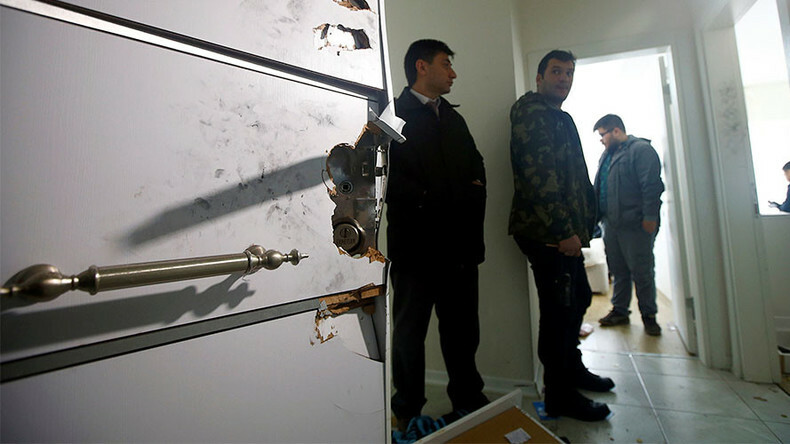 Turkish media earlier reported that after Masharipov fled the scene of the New Year’s eve massacre, the terrorist initially hid in a safe house, where his wife and children joined him. The attacker then took his 4-year-old son and went on the run. The boy was alongside the shooter when security forces arrested him on Monday evening, Sondakika reported. Masharipov resisted arrest, local media said, sharing a photo of the suspected attacker with bruises on his face. Operations against other potential terrorist cells are currently underway, Anadolu news reported citing sources. The manhunt for the suspect, who was captured in an Istanbul district not far from the Reina night club, was most likely, intentionally prolonged by the authorities, Max Abrahms, a terrorism expert at Northeastern University in Boston told RT. “I think it’s a widespread impression that this guy was not operating entirely alone, this is not an example apparently of what we call a “lone-wolf attack.” He seems to very much be a part of the Islamic State organization and connected to network of central Asians in this area,” Abrahms said. A massive manhunt has been ongoing in Turkey ever since the shooter fled the scene after firing over 180 bullets at innocent people at the Reina night club. Most of the victims were foreigners while 11 were Turkish citizens. During the manhunt, Turkish anti-terror forces reportedly detained at least 35 suspects allegedly related to the attack. Previously, the Islamic State (IS, formerly ISIS/ISIL) terrorist group claimed responsibility for the New Year attack, saying it was revenge for Turkish military involvement in Syria. The arrested suspect will be questioned, amongst other things, about possible links to “foreign intelligence services.” Just before the raid, Turkey’s Deputy Prime Minister, Numan Kurtulmus, once again voiced Ankara’s suspicion that Masharipov could not have perpetrated the attack without outside help. Kurtulmus later congratulated security services for capturing Masharipov, tweeting that "Our war with terror and the powers behind it will continue to the end."